As part of my digital clean up, I needed to move email from an account on one domain, to an account on another domain. Google Apps used to have a good tool for this, it ran from the cpanel over IMAP, and was in essence a server-server tool, but this got deprecated. Now, you need to download the email locally from the source account / domain, and then upload to the destination account / domain. 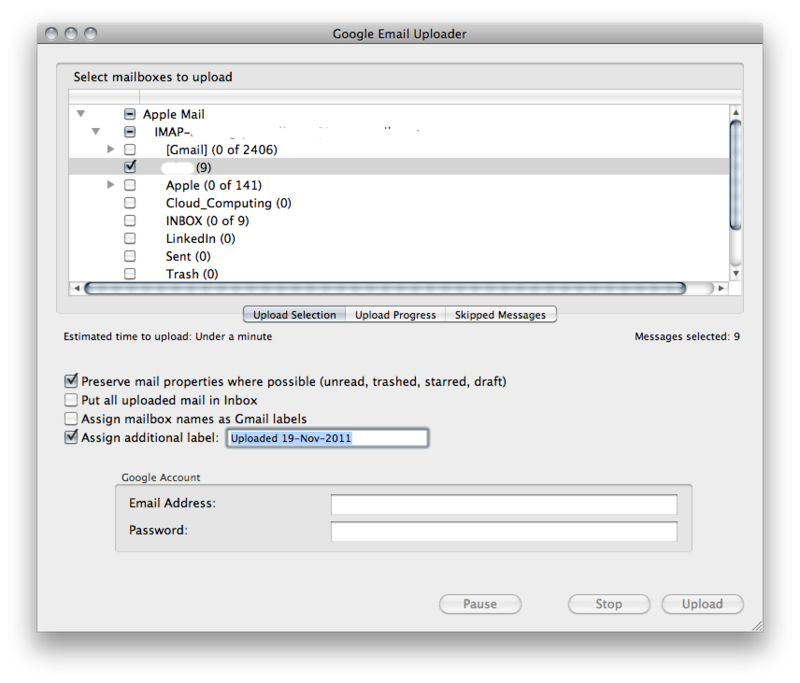 On a Mac there are two ways how to do this: use MailFetcher and the Google Email Uploader. The Email Uploader is very nice. It links to your Apple Mail or Thunderbird on your local machine, shows folders, and you can selective which folder to upload. You can also give the transferred folder a name so you can see it. To get the email onto your local machine you need to use these instructions. You would need the domain admin to turn on IMAP first of course. You may find that nor all messages can be moved across. The uploader won't move corrupt messages, messages that are not RFC 822 compliant, or messages with disallowed attachments eg .exe. If the message is not RFC 822 compliant then you'll see "Invalid RFC 822 Message" in the window. I found that Mail did not see these messages either, so I couldn't use drag and drop, but since they are plain text you can view them using QuickLook in the finder, and decide if you really need them. 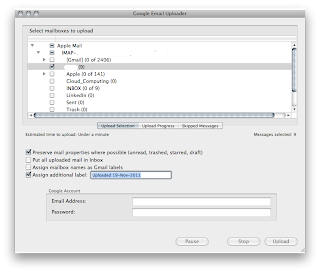 Also, if a folder / label has over 500 messages in it, you'll find progress quite slow after the 500. It gets to 500 really fast, maybe only a few minutes, depending on attachments. Thereafter you are limited to one message per second, so a folder with, say, 4000 message will take about an hour to upload. You might consider splitting a large folder up. You also likely parallelise things up, by running the uploader more than once, but I didn't try that. I know you can multiple GAMME uploads concurrently, to get around the ingestion limit. Interesting service. If your organisation cares about SAS70 and other certifications would need to check on its status. I didn't see anything on its web site about data privacy, access controls etc.